This Press Release is embargoed against publication, telecast or circulation on internet till 5.30 pm today i.e. 29th January, 2016. The Central Statistics Office (CSO), Ministry of Statistics and Programme Implementation has released the First Revised Estimates of National Income, Consumption Expenditure, Saving and Capital Formation for the financial year 2014-15 (with Base Year 2011-12) as per the revised policy. Second Revised Estimates of the years 2011-12 to 2013-14 (with Base Year 2011-12) have also been released as per the calendar of revision of base year. 2. The First Revised Estimates for the year 2014-15 have been compiled using industry-wise/institution-wise detailed information instead of the benchmark-indicator method used at the time of release of Provisional Estimates on 29th May, 2015. The estimates of GDP and other aggregates for the years 2011-12 to 2013-14 have also undergone revision due to use of latest available data on agricultural production; industrial production especially those based on the provisional results of Annual Survey of Industries (ASI): 2013-14, final results of ASI: 2012-13 and revised results of ASI: 2011-12; government expenditure (replacing Revised Estimates with Actuals for the year 2013-14) and also more comprehensive data available from various source agencies and State Directorates of Economics and Statistics. 4. Nominal GDP or GDP at current prices for the year 2014-15 is estimated as Rs. 124.88 lakh crore while that for the year 2013-14 is estimated as Rs. 112.73 lakh crore, exhibiting a growth of 10.8 per cent during 2014-15 as against 13.3 per cent during 2013-14. 5. Real GDP or GDP at constant (2011-12) prices for the years 2014-15 and 2013-14 stands at Rs.105.52 lakh crore and Rs. 98.39 lakh crore, respectively, showing growth of 7.2 per cent during 2014-15, and 6.6 per cent during 2013-14. 6. The changes in the Gross Value Added (GVA) at basic prices in different sectors of the economy at current and constant (2011-12) prices are presented in Statements 4.1 and 4.2 respectively. At the aggregate level, nominal GVA at basic prices increased by 10.5 per cent during 2014-15, as against 12.7 per cent during 2013-14. In terms of real GVA, i.e., GVA at constant (2011-12) basic prices, there has been a growth of 7.1 per cent in 2014-15, as against growth of 6.3 per cent in 2013-14. 8. The growth in real GVA at during 2014-15 has been higher than that in 2013-14 mainly due to higher growth in ‘mining and quarrying’ (10.8%), ‘electricity, gas, water supply & other utility services’ (8.0%), ‘trade, repair, hotels & restaurants’ (10.7 %), ‘financial services’ (7.9%), ‘public administration and defence’ (9.8%), and ‘other services’ (11.4%), as may be seen from Statement 4.2. At constant prices, in the primary sector (comprising agriculture, forestry, fishing and mining & quarrying), ‘agriculture, forestry & fishing’ has shown a decline of 0.2 per cent while ‘mining and quarrying’ increased by 10.8 per cent during 2014-15 as against the growth of 4.2 and 3.0 per cent, respectively during the year 2013-14. The growth of secondary sector (comprising manufacturing, electricity, gas, water supply & other utility services, and construction) is 5.4 per cent and that of tertiary (services) sector is 10.3 per cent during 2014-15, as against a growth of 5.3 per cent and 7.8 per cent, respectively, in the previous year. 9. Nominal Net National Income (NNI) at current prices for the year 2014-15 stands at Rs. 110.08 lakh crore as against Rs. 99.34 lakh crore in 2013-14, showing an increase of 10.8 per cent during 2014-15 as against an increase of 13.2 per cent in the previous year. 10. Gross National Disposable Income (GNDI) at current prices is estimated as Rs. 127.46 lakh crore for the year 2014-15, while the estimate for the year 2013-14 stands at Rs. 115.29 lakh crore, showing a growth of 10.6 per cent as against 13.2 per cent in the year 2013-14. 11. 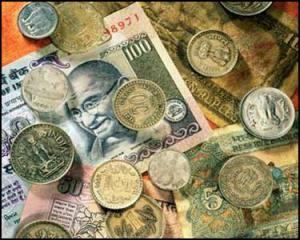 Gross Saving during 2014-15 is estimated as Rs. 41.17 lakh crore as against Rs. 37.25 lakh crore during 2013-14. Rate of Gross Saving to GNDI for the year 2014-15 is estimated as 32.3 per cent, the same as in 2013-14. 12. The highest contributor to the Gross Saving is the household sector, with a share of 57.8 per cent in the year 2014-15. However, the share has declined from 63.4 per cent in 2013-14 to 57.8 in 2014-15. This decline can be attributed to the decline in household savings in physical assets, which has declined from Rs. 14.61 lakh crore in 2013-14 to Rs. 13.79 lakh crore in 2014-15. On the other hand, the share of Non-Financial Corporations has increased from 32.7 per cent in 2013-14 to 37.2 per cent in 2014-15. The share of Financial Corporations increased marginally from 7.9 per cent in 2013-14 to 8.2 per cent in 2014-15, while the dis-saving of General Government has decreased from 4.0 per cent in 2013-14 to 3.2 per cent in 2014-15. 13. Gross Capital Formation (GCF) at current and constant prices is estimated by two approaches – (i) through flow of funds, derived as Gross Saving plus net capital inflow from abroad; and (ii) by the commodity flow approach, derived by the type of assets. The estimates of GCF through the flow of funds approach are treated as the firmer estimates, and the difference between the two approaches is taken as “errors and omissions”. However, GCF by industry of use and by institutional sectors does not include “valuables”, and therefore, these estimates are lower than the estimates available from commodity flow approach. 14. Gross Capital Formation (GCF) at current prices is estimated as Rs.42.76 lakh crore for the year 2014-15 as compared to Rs. 39.12 lakh crore during 2013-14. The rate of GCF to GDP declined from 34.7 per cent during 2013-14 to 34.2 per cent in the year 2014-15. The rate of GCF excluding valuables to GDP stands at 33.3 per cent and 32.7 per cent for the years 2013-14 and 2014-15 respectively. The rate of capital formation in the years 2011-12 to 2014-15 has been higher than the rate of saving because of net capital inflow from Rest of the World (ROW). 15. In terms of the share to the total GCF (at current prices), the highest contributor is Non-Financial Corporations, with the share rising steadily from 45.7 per cent in 2011-12 to 52.0 per cent in 2014-15 (Statement 9). Share of household sector in GCF is also significant, but has declined from 43.4 per cent in 2011-12 to 33.9 per cent in 2014-15. The share of General Government in GCF has increased from 9.6 per cent in 2011-12 to 12.9 per cent in 2014-15. 16. Within the Gross Capital Formation at current prices, the Gross Fixed Capital Formation (GFCF) amounted to Rs. 38.44 lakh crore in 2014-15 as against Rs. 35.64 lakh crore in 2013-14. The rate of GFCF to GDP at current prices was 30.8 per cent in 2014-15 as compared to 31.6 per cent in 2013-14. The change in stocks of inventories, at current prices, increased from Rs. 1.80 lakh crore in 2013-14 to Rs. 2.21 lakh crore in 2014-15, while the valuables increased from Rs. 1.63 lakh crore in 2013-14 to Rs. 1.93 lakh crore in 2014-15. 17. The rate of Gross Capital Formation to GDP at constant (2011-12) prices has decreased marginally from 36.2 per cent in 2013-14 to 35.9 per cent in 2014-15. 18. Private Final Consumption Expenditure (PFCE) at current prices is estimated at Rs. 71.93 lakh crore for the year 2014-15 as against Rs. 65.08 lakh crore in 2013-14. In relation to GDP, the rates of PFCE at current prices during 2013-14 and 2014-15 are estimated at 57.7 per cent and 57.6 per cent respectively. 19. At constant (2011-12) prices, the PFCE is estimated as Rs. 55.20 lakh crore and Rs. 58.64 lakh crore, respectively for the years 2013-14 and 2014-15 respectively. The corresponding rates of PFCE to GDP for the years 2013-14 and 2014-15 are 56.1 per cent and 55.6 per cent respectively. 20. Government Final Consumption Expenditure (GFCE) at current prices is estimated as Rs. 13.65 lakh crore for the year 2014-15 as against Rs.11.53 lakh crore during 2013-14. At constant (2011-12) prices, the estimates of GFCE for the years 2013-14 and 2014-15 stand at Rs.9.77 lakh crore and Rs.11.03 lakh crore respectively. 21. Per Capita Income, i.e., Per Capita Net National Income at current prices, is estimated as Rs.79,412 and Rs. 86,879 respectively for the years 2013-14 and 2014-15. Correspondingly, Per Capita PFCE at current prices, for the years 2013-14 and 2014-15 is estimated at Rs. 52,022 and Rs.56,772 respectively. 22. More details of these estimates are available in Statements 1-9 appended with this Press Note. 23. The use of latest available data from various agencies and company-wise revalidation of the industry-wise and institution-wise (public/private) classification of companies in the MCA21 database have resulted in some changes in both the levels of GVA and growth estimates for all the years. The reasons for revision in the estimates of the years 2011-12 to 2013-14, released on 30.01.2015 and the Second Revised Estimates are mentioned in the Annexure. 24. The following statement gives the major reasons for variation between the Provisional Estimates (released in May 2015) and the First Revised Estimates of GVA for 2014-15. Revision in estimates of production of some crops, livestock products, fish and forestry products; and use of annual financial reports of public & private sector companies, in place of IIP in the case of ‘mining & quarrying’. Actual analysis of financial reports of a larger sample of public & private sector companies instead of key financial indicators derived from advance filings of a small sample of Companies used earlier. Use of Revised Estimates of sales tax and other items in central & state government budget documents instead of Budget Estimates; and replacement of key financial indicators derived from advance filings of a small sample of Companies with actual analysis of financial reports of a larger sample of public & private sector companies. ii. Provisional Estimates for the year 2015-16, along with estimates for all the four quarters of the year on May 31, 2016. 8. Estimate of GCF derived from this formula is taken as the “firmer” estimate and the difference between this estimate and the sum of GFCF, CIS and valuables is taken as “errors and omissions”, as referred in 9 above.